When it comes to your child’s oral hygiene, protecting those precious baby teeth are just as important as any other aspect of their health. However, we all know that babies and toddlers aren’t always professionals when it comes to brushing, and the sweet flavor associated with most toddler toothpastes encourage children to swallow the toothpaste instead of spitting it out. This can sometimes provoke anxiety and suspicion in parents, as there doesn’t seem to be enough valid information out there about the safety of ingesting fluoride. After all, it does say on fluoride toothpaste tubes to “not ingest” and to use supervision with children. 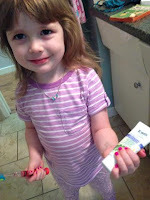 Thankfully, Tom’s of Maine has come out with a lovely product for toddlers that are just learning to brush – Tom’s of Maine Toddler Training Toothpaste. 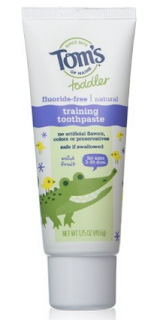 This great tasting, fluoride free product can help make teeth brushing a healthy and fun habit for your toddler. The mild fruit taste has no artificial flavors, colors or preservatives, and is produced without sodium laureth sulfate (a foaming agent that is thought to have questionable health risks) or propylene glycol (a preservative additive). The dispenser is easy to use and no-mess. And most of all, you’ll feel good about letting your independent little one brush and swallow away without feeling stressed about them ingesting anything toxic! Tom’s of Maine Toddler Training toothpaste is available at your local London Drugs, Wal-Mart, Shopper’s Drugs Mart and Superstore, as well as many other participating stores.